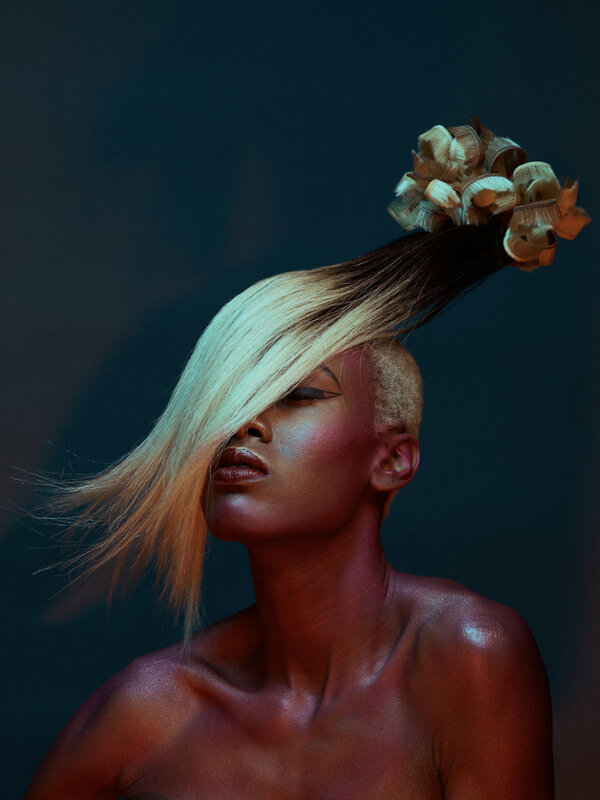 I love Avant Garde hairstyling, anything goes. This collection stems from my love for all things horror and sci fi. I wanted this collection to have the asian horror feel to it and the models would become these beautiful, macabre "mutants". I wanted the hair to create visual movement, that similar to water pouring from a pitcher. I knew I did not want wardrobe for this collection and instead opted for body make up by award winning make up artist, Isidro Valencia. We had previously worked together with photographer, Jacob Roberts who shot Isidro's Make up collection a year prior. I knew I wanted him to photograph this collection based on his style of photography. This collection was 1 of 5 shoots executed in the winter of 2016 for NAHA 2017. Although it was not nominated we were honored to have it featured on Bangstyle. I did some preliminary sketches for inspiration but was most inspired when I visited a local hair shop and fund two-toned hair extensions in various lengths. I took them home and quickly unpackaged them. I hand cut wire mesh to create the base for the hairpieces by shaping them into "stair like" pieces in various lengths. I then meticulously hot glued the extensions parallel onto the mesh frames. 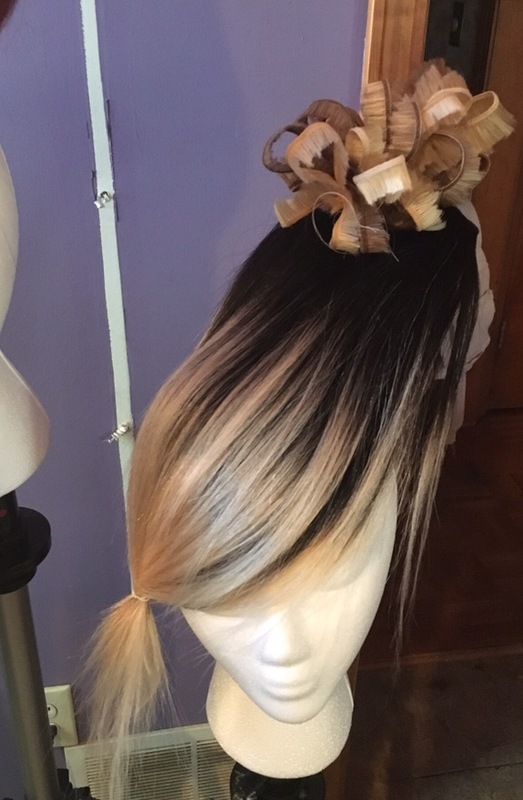 The top pieces were created by cutting the hair away from the "weft" and sewing them into the shape to dorm the top of the hairpieces. I love creating something that will eventually be adapted to the model's head. I was very happy with models I booked for this collection. I wanted both male and female models. To adhere the hair pieces to each models head, scalp hair was cornrowed to create a supportive base for hair and bobbie pins. The top pieces were created by cutting hair extension at the "wefted" (where the hair was sewn together) coverging them together with needle and thread. Prep time for each model average 2 1/2 hours for both hair and make up for a total of 7 hours. We started early on a cold morning fortunately I rented a nice studio space at Breckingridge Inn. We staggered the models so they would be fresh and energized for their time in front of the lens and to give us adequate time to ready each model. I made sure to have plenty of food on set to keep everyone happy. Working with Isidro is amazing. We always pair well together on set. He created a red contour look on each of the models bodies an faces, Dark rimmed eyeliner on the female models and red lips on all models. 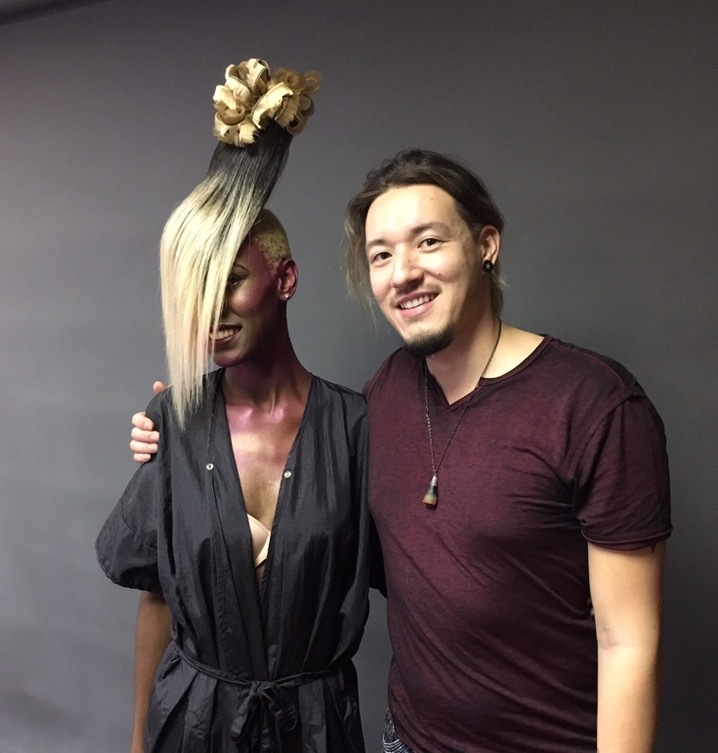 I submitted the collection to Lori Balsamian at Bangstyle and she loved the collection and wanted to exclusively feather it. I was so grateful for the team. It's amazing to see a collection materialize from a concept start to finish. The process can be time consuming booking all the right people and gathering an building all the components but when everyone brings their talents that when magic is created.